Language is in the thrall of equivalences and allusion. We say what something is by saying what it reminds us of, of what it is like. We talk in likenesses. When speaking of art this becomes even more pronounced. The metaphors entwine, and unravel. The illusionistic idiom is so engrained within language we can move over it, almost oblivious to its presence. We optimistically cling to the chimeric function of language, using it as in imprecise tool, a blunt knife. The drawings of Margrét H. Blöndal make language feel particularly blunt. Most often the drawings are composed of a figure or form isolated on the page but with a surrounding halo of olive oil. The subtle tonal shift this enacts upon the paper surface literally holds the image. It holds it in place, on the page, in a cellular or embryonic space. Blöndal starts each drawing by looking at an image – most often on the computer screen – yet during this process her focus becomes increasingly intent and singular. The thing which is being looked at ceases to be as it appears. The very act of looking shifts its sense and abstracts it from the world. In their singular presence, a thing amongst a blank space, they can feel as though they are something akin to a naturalist’s studies of forms from nature. Presented as they are here, in the pages of a book, that is even more pronounced. Perhaps it is an added effect of the oil surround, but there is frequently a sense of looking at something microscopically. We seem to be peering down on these forms, like they are laid upon a microscope slide: clusters of amorphous shapes that could be pollen spores or a growing culture of bacteria. Yet elsewhere there is a shift in scale where an entanglement of lines evokes the topographic: a converging of footpaths through the snow or a river delta braiding and diverging. The work ensnares us in this way, suggesting that a structuring logic can be read across the individual drawings, or that meaning will arise from the singular becoming many. And in a sense it does, this does happen. We start to understand the work differently as a totality, much like seeing traits and resemblances between family members. Yet the drawings tease at this possibility of reference. For instance, how can a sense of scale be present when the forms are not quite recognizable as things? Is it even appropriate to think of pictorial scale with work such as this? We see things in the drawings, project narratives and likenesses onto these uncertain forms. In this much, the experience of the viewer is a mirror to Blöndal’s creative act. Where, for her, looking strips the context and representational certainties from the image, the viewer’s gaze may attempt to reconstruct and extrapolate to make the drawing make sense. We are caught – enticed – into recognizing forms and ascribing reference. Yet it is a reference just beyond reach. The work fluctuates between representation and abstraction, yet never exactly being one nor the other. There is only just enough information present, and a sufficient amount absent, to cause us to withdraw from acknowledging with certainty what we are seeing. In this respect, the drawings occupy a liminal space, or rather more precisely, the experience of them occurs within this liminal space, where the abstractive effect of Blöndal’s scrutiny meets the viewer’s intent searching for reference. It is a space in which we are conscious that looking is not merely a passive activity but rather is very much an act of the imagination. 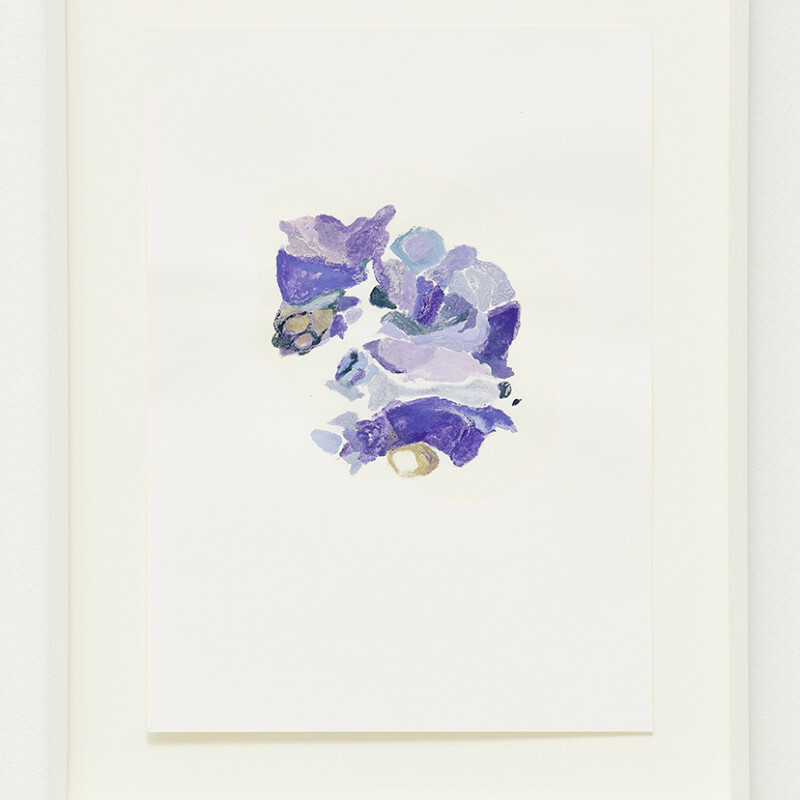 In addition to these works on paper, Blöndal also makes sculptural assemblages. These too are composed of objects; usually found, manmade objects. They are arranged in subtle accumulations and singular moments, incurring and occupying a particular sense of space. These, too, can be thought of as drawings. They share a lyricism that speaks of the objects past uses and the incongruity of their juxtaposing as they unwind and implicate the space of their architectural setting. To encounter these clusters of things is an unusual experience, similar to that of looking at the drawings. Even though the objects, of which the work is composed, are often familiar the arrangements in which Blöndal configures them affords them an unexpected presence. Things may be propped, hang or tied around the gallery; objects commune in conversation. The eloquence of these arrangements is complicated by the quiet histories of the constituent elements. These sculptures are made of things which used to be other things; things which inhabited the world in different ways, with different functions or previous decorative purposes. Yet what is most notable is the sense which these sculptural moments convey. They make sense as formal sculptures and as things in the world, even though how they achieve this is not obvious. And despite them not being surrealist in sentiment there is a continuity between the sculptures and the quote from Lautréamont – favoured by André Breton – concerning the chance meeting “between an umbrella and a sewing-machine upon a dissecting-table.” It is difficult to ascribe meaning to such a description but it nonetheless has a palpable unsettling logic. Similarly Blöndal’s accumulations have sense and a poetics which melds form and history but one which is also difficult for language to quantify or explain. As much as we try to overlay narrative and metaphor upon these sculptural arrangements, it is as though the work welcomes them but then effortlessly shrugs them off. The sculptural assemblages and drawings operate in concert with one another. The drawings’ inherent spatial properties echo the experiencing of moving through the sculptural works. Both in the sculpture and the drawings the work adheres to its spatial context. In the case of the drawings this can be seen in that they are neither confined by an illusionistic space nor marooned entirely upon the page. Instead, the drawings are almost architectonic in their setting, there is a physicality to the oil on the paper which demarcates a natural boundary. It is an actual presence, a saturation of a surface—the page is not merely a site of imagination and project, it is material fact. The conjunction of elements that happens on the page has a specific relationship to those that are created within the sculptural works. Yet while the sculptural works are more likely to be composed of manmade elements, the drawings can be said to be more organic in nature. Obviously the olive oil soaked paper contributes to this, but also the forms themselves are more suggestive of things from the natural world. The subject of a few of the drawings may appear contrary to this, perhaps there is a pink refuse bag or a crumpled piece of textile, but in the main these feel non-manmade. This is in part due to the nature of their making. The drawings are not overly constrained, the hand of the artist is evidently present. Further contributing to this is a colour palette that is more muted and reserved – than in the sculptural works – where the forms at times can feel almost washed out of their colour, their presence receding, it is as though the form no longer has sufficient mass to exist. Margrét H. Blöndal’s work teases at the edges of sense and the familiar. The world is gently nudged, not to make it allegorical but to expose an essence and to concentrate the way in which we look upon it. It exposes a poetry of the unexpected, and is an antidote to the restless mind which continually seeks meaning and reference. The more that is demanded of it the less the work complies to such strictures: as we pry at the drawings with language, it is language which feels inadequate, almost feeble. While equivalences and proximities are possible and hint towards the evident sense in the work, they nevertheless feel only to be approximations that point in a general direction, but leave much unsaid. And even though the drawings express through a subtlety and a lightness of touch, they still feel exceptionally generous. They extend and complicate the spatial eloquence that is encountered in the sculptural works through the fluctuations between abstraction and representation. This makes the experience of looking at Blöndal’s drawings one similar to seeing something familiar in the twilight, its presence curiously reassuring but its form somehow remaining unsettled in the waning light. It is in this sense that the drawings create a place where a form is on the verge of becoming something, and the quiet strength of the work is in how it holds that space, allowing it to breathe and shift; for it to be active, enlivened. As a viewer we become immersed in the works’ complexities and concious of its generosity. And yet as generous as the work is, it is also defiant, it resists being explicable. Language feels too coarse to convey the eloquence of the drawings, they are beyond translation, and are all the better for it.